An average cordless impact wrench can be stressful at times, so it’s essential that you limit your choices to the best cordless ratchets available. Make no mistake though even an average one is still a useful addition to your workshop, considering it will still be taking the strain off the DIY effort you apply in changing your car wheels. However, new improvements and technological advancements have led to the discovery of modern batteries and a series of motor technologies that have gone at length to make them just as effective as their compressor-powered predecessors, with an added advantage of featuring no hoses to worry about. That’s beside taking all the strain off the effort you apply in changing your car wheels and NOT just a chunk of it. Translated, this means more productivity and less fatigue on your side. Even better, a good impact wrench is super lightweight and compact, and therefore well suited for general maintenance jobs, including suspension work and the brake. 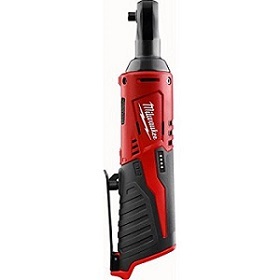 The Milwaukee 2456-20 M12 is a highly rated cordless electric ratchet, sought-after for producing plenty of power and top speed, and it’s all thanks to its 12 V motor that can provide up to 30 ft-lbs of torque and 250 RPM, with adjustable speed trigger for the much-needed speed control. There’s nothing complicated about handling or using the tool. If anything, it’s among the simplest ones on the market. Designed for optimized performance, the compact ratchet is also designed to offer overload protection by making the necessary adjustments on total system communication between the tool, its battery, and the charger. Read this keeping in mind that the battery is usually sold separately. Also, as expected, the tool comes with LED light for illuminating the dark spots you’re working on. Meaning you won’t need external lighting or torch while working in the dark or reaching shadowy locations. More importantly, the tool allows you to monitor its charge for downtimes while working precisely. You’ll, therefore, be in the position to know when to recharge your ratchet and how long a particular amount of charge is going to take you instead of dealing with abrupt shutdowns. The Ingersoll Rand 170G ratchet wrench is a 3/8 inch high-power, high-torque tool. Powered by an in-built lithium-ion battery, the ratchet is designed to deliver all the power you need to get any kind of wrenching job done. It’s the ideal tool for any kind of job, considering it can produce up to 55 foot-pounds of torque with about 170 RPM. Perfect for all kind of applications requiring light disassembly and assembly. You can even use the ratchet to access tight spaces. As with all products within the Ingersoll Rand’s Edge Series, this tool flaunts an exceptionally rugged and compact lock. It’s also extremely lightweight, in addition to featuring a heat-treated TwinPawl Plus ratchet head that will be adding to its durability. The prize-winning ergonomic design of the ratchet is among the reasons the 170 G is widely favored. Designed to deliver excellent torque accuracy, the tool is also billed for its contoured grip that will be working to ensure your hands are totally comfortable while you’re getting a job done. Announced for the top-rated power and speed, this sub-compact ratchet comes encased in a stainless steel housing that will be ensuring it lasts for the longest time possible. 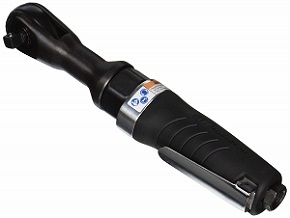 This makes it the right kind of tool for auto mechanics professionals tackling tough jobs. Even better, the ratchet remains compact with tool-belt portability. Arriving with it is a three-quarter inch low-profile head, which allows it to penetrate engine bays and some of the tightest spaces you may think of. With housing made of steel, you can also bet on the durability of the ratchet. Add that to the long warranty and stable battery life, and you’re guaranteed your peace of mind. Also worth mentioning is the unique onboard fuel gauge that will be working to prevent abrupt switch-offs by alerting you in advance in case of lower battery status. A 12 V lithium ion battery powers this 3/8 inch cordless ratchet wrench. Specifically, the ratchet is ergonomically designed so it can penetrate tight spaces. It also features a lever that allows you to choose between forward or reverse and a durable aluminum casing for protecting the gearbox. Worth mentioning is the variable speeds and electric brake switches. Its grip comes covered with a soft anti-slip material for comfortable handling. 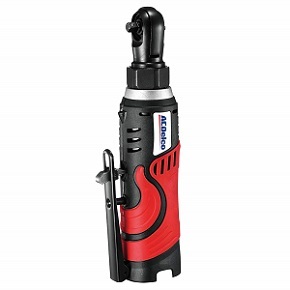 Overall, the cordless ratchet offers excellent value for every penny spent on it well built and efficient power. The kit you buy will also come with two batteries, all designed to supply an adequate amount of juice besides lasting long. Its housing is made from tough, bullet-proof material for added durability. It’s also considered one of the most lightweight, yet powerful cordless ratchet wrench on the market as at the time of wringing this. This is the ratchet you buy if you hate noise. 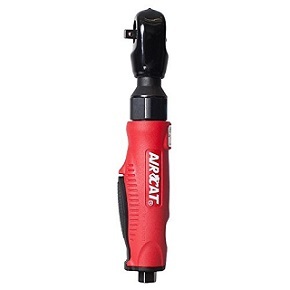 Speaking of which, the Aircat ACR802R is considered one of the quietest cordless ratchets available. It’s not exactly comparable, especially when stacked against the other ratchets on this list, but it produces an impressive amount of torque. For what’s worth, it actually produces 70 70 ft lbs. of working torque and 90 ft Ibs. of maximum torque. Its billing points include its power, the innovative design, and the silence. It also happens to fall among the few ratchets of its kind that can get even the hardest of the jobs you think of doing. With a housing made from tough material, the ratchet has proven to be pretty strong, hence recommended to the careless mechanics with a tendency to drop, neglect or toss their tools around. The silence also makes it an ideal choice of ratchet wrench for the mechanics working for longer periods of time. Its trigger is super soft and touch-sensitive, which makes it easy to both handle and control. Plus there’s nothing complicated about operating its directional changer, in addition to turning free. Suffice it to say, this is the tool you buy and when it’s over, you fork over your money for the same model. As far as power, air connection size and wrench size go, Ingersoll-Rand brands stand shoulder and head over a vast majority of auto-mechanic tools filling up the market. Shaped to take the same semblance as an actual ratchet, for simplicity in usage, the compact ratchet fits in a unique class of torque wrenches. The wrench itself is diligently designed. Its mechanisms feature an optimized gear that’s configured to optimize the flow of air going through the tool. 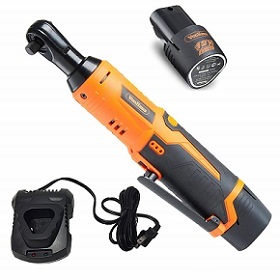 This enhances the performance output of the tool, thus making your wrenching job even simpler. Its power torque is considered moderate, with 70 ft. Ibs. being the highest torque, it can produce. But for a wrench of its kind and formation, this ought to be the highest torque you can find. More interestingly is that this torque is produced at 300 RPM, which makes it one of the fastest torque ratchet available. As expected, the tool has been tested and found to be extremely quality, thanks to Ingersoll-Rand’s choice of quality housing materials for almost all of their products. The 109XP is no exception, considering it can still take a number of falls and bangs and still operate perfectly as expected. The only limitation is its weight. At 3.5 Ib. the 109XPA is ranked among the heaviest wrenches in the class it’s in. Its control system is also designed to allow for variable speeds in both forward and reverse directions for an even simpler loosening and tightening of bolts and other fittings. The VonHaus Cordless Ratchet Wrench can be summed up in three words: powerful, versatile and cordless. Designed to deliver a maximum torque of up to 35 ft. Ibs. the tool offers impressive performance, in spite of its flexibility and compactness. Comes with an anti-slip grip that makes it both comfortable and easy to hold, even under an awkward position. Also featured is a well-placed forward and reverse lever that makes it extremely simple to switch between loosening and tightening of nuts. The tool is also hailed for its superior speed, going at 280 rpm. It also features a variable speed trigger for enhanced stability and control. That’s without mentioning a wide range of other improved feature that will be working to improve its usability. It also comes with built-in LED light for illuminating dark locations while working and onboard furl gauge monitor that will be alerting you in case of downtimes or when the ratchet is about to run out of juice, thanks to the three light indicators green, amber and red, all of which will be working to precisely alert you on the amount of charge left. 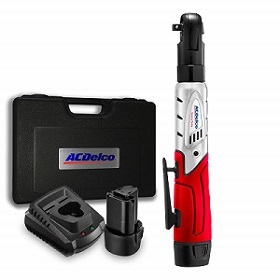 The ACDelco tools mini ratchet is designed to make it a cinch to switch directions in tight and narrow spaces. They are incredibly lightweight and happen to feature an ergonomic body with soft, non-slip handles for much more comfortable grips no sharp edges. The rear exhaust is also designed to reduce noise by redirecting the air entering it away from work. Also featured in this high-quality ratchet is a forward-reverse lever which adds to its overall effectiveness and convenience. Its angled compact head is also designed to come in handy when loosening bolts in tight spaces. It also arrives with an in-built LED light for illuminating the dark locations while working. Perhaps more interesting about this high-quality wrench is its overall lightness, which works to enhance your working speed. It additionally appears with its carrying bag just in case you need to bring it with you while traveling. The compact size also makes it super convenient to always carry around with you. Durable metal gearbox, design to produce a maximum torque of 27 ft. Ibs. Angled compact head for a safe penetration of narrow spaces. Craftsman released their C3 19.2v cordless ratchet wrenches not long ago. A common example is the Brushless drill, which boasts up to 600 in. Ibs. of torque and a newfangled multi-speed impact driver. And just as exciting as the brushless, is the Max Axess Power Ratchet. Core among its top features is that it arrives with a pass-through design, which allows it to access the fasteners on threaded rods or longer bolts. Designed to work with a certain type of adapters, the power ratchet often tends to produce a series of low-profile benefits. The adapter also allows them to be used with a standard square drive and a long host of other accessories. 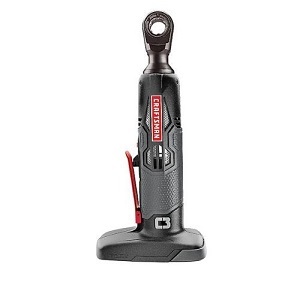 The reasonable power ratchet is also favored for the simple fact that it can snugly fit into tight spaces, even where impact drivers, cordless screwdrivers, and drills cannot. Buying a good impact wrench isn’t as simple as walking to a ratchet aisle and picking one before proceeding to the counter to clear with the cashier. A lot of features and other factors need to be carefully considered. Keep in mind that these factors can vary depending on how you intend to use the tool. If your plan is to have one at home, and which you’ll be occasionally using on your car, then your needs significantly vary with that of an auto-mechanic whose plan is to find something they’ll be using on a daily basis. With torque, you always aim for the highest you can find. Which is another way of saying the more torque you get, the more capable the tool will be? Never buy an impact wrench without considering its weight. That’s because not all wrenches weigh the same, and the heavier they are, the more fatigued you’re likely to get while working. So it’s wise to always aim for the lightest ratchet wrench you can find, other factors held constant. Simple the smaller the impact wrench, the better. Small means you can use the device in tighter spaces. The small size may come at the expense of the generated torque, so it’s essential that you find a way to strike a balance between the two. This is simply the ordinate number of times the anvil will be striking the tool with every minute count. The higher the number, the faster the wrench, with regards to driving screws and loosening tightly torqued bolts. At what speed does the wrench turn when no load is in place? Higher speed can be interpreted to mean the wrench will be fastening and unfastening more screws in a shorter time. So the more the load speed, the better the wrench. Most wrenches come with a 1/2 inch drive, with the 3/8 inch drive being the second most popular drive size. The 3/8 inch comes in a much small total package, but with less torque compared to their 1/2 inch counterparts. With torque adjustment, you can make the necessary adjustment to the output torque instead of relying on what’s supplied. This is important as it reduces the risk of over-torquing, which may lead to an abrupt snapping of your bolt head. With the above guidelines and recommendations, then finding the right cordless ratchet shouldn’t be that much of a hassle. All you have to do is evaluate your needs. Your budget is also a factor in this, so take some time to go through all the options fitting your budget before you can go ahead and decide which cordless ratchet is best suited for your needs. 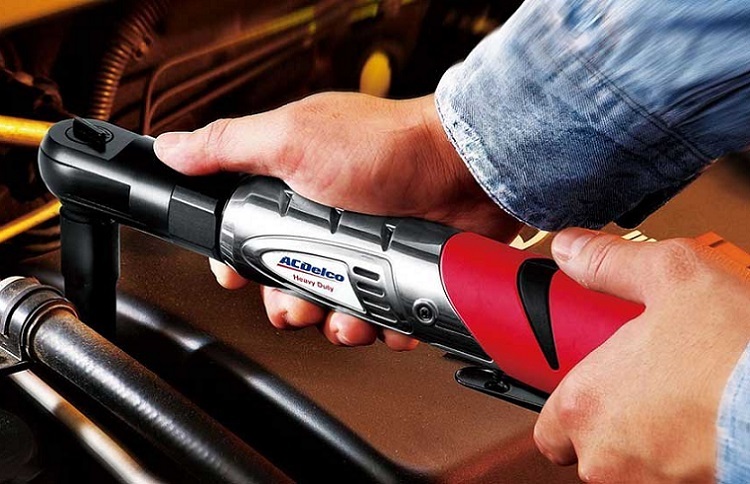 The point is to make sure that you head home or to your workplace, with the best cordless ratchet you can find. And by best we mean, one that promises to save much of your time, increase your productivity and in general works to make your life much more comfortable. Keep in mind that the list features the best of the ratchet wrenches you can find on the market. So provided your selection falls within the items on the list, then one thing is clear there would be nothing to regret with the choice you make.